So where do we go from here? That was the question I discussed with a group of managers from a large client company this morning. And the mood was not good - to put it mildly. Still, it could be worse: they could be the Department of Finance. I think Brian Lenihan must feel all his Mondays have come at once: another day another doldrum. The news this evening that the Government is running a €9.4 billion deficit - which it hopes will end up at €6.5 billion by the end of the year - is not good. That hoped for outturn might prove to be wishful thinking if tax returns in November (following the pay and file deadline of 31st October) fall short of expectations. Such returns are based on preliminary taxes for 2008, any outstanding balances of income taxes for 2007 and capital gains taxes for the first 9 months of 2008. I can't see any of these breaking any records on the upside, more the reverse frankly. Consumers are battening down the hatches as fears about unemployment for the majority (and real unemployment for the minority) lead to rising savings levels - so consumer spending will remain weak. Exports are under pressure from a strong euro and weak demand in importing countries. Government spending will be severely curbed in light of weaking taxes, even with extra borrowing. The construction sector is in intensive care - and will remain there for several more years. Some things will help: falling interest rates, for example, through the first half of 2009 (even the ECB will tire of monetarist masochism and start cutting rates). Also surge in savings in banks which should help sort their balance sheets and liquidity issues which should - other things being equal and all that - lead to more lending capacity when it comes to business borrowers. But the reality is that things will get worse before they get better. Probably much worse. 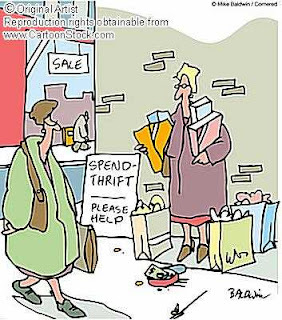 Consumers will rediscover the joys of thrift, and businesses will rediscover the 'joys' of stagnation. In the long run, economic growth is a function of really just one variable, namely: productivity. Raising our productivity means investment, innovation and education. No surprises there. Implicit in the first two is access to capital via banking lending - not quite a given at present. But that will change - slowly but surely - once their burnt fingers have healed and the banks rediscover the virtues of potential-backed lending rather than asset-backed lending. Eventually. A pity more Irish banks didn't produce analyses like this. It might even give them a few ideas for how to grow their own business through the turbulence ahead. I certainly hope the Minister for Finance has time to look beyond the year end's tax returns to ensure we get back on a growth track sooner rather than later.